One of the things that I love most about cold winter nights is being able to cosy indoors, as I treat myself to a relaxing bath and an evening of pamper. With a busy schedule as a mommy & now practically working full time, I don't get to have me time quite often... so when I finally set some time aside I make sure to go all out. 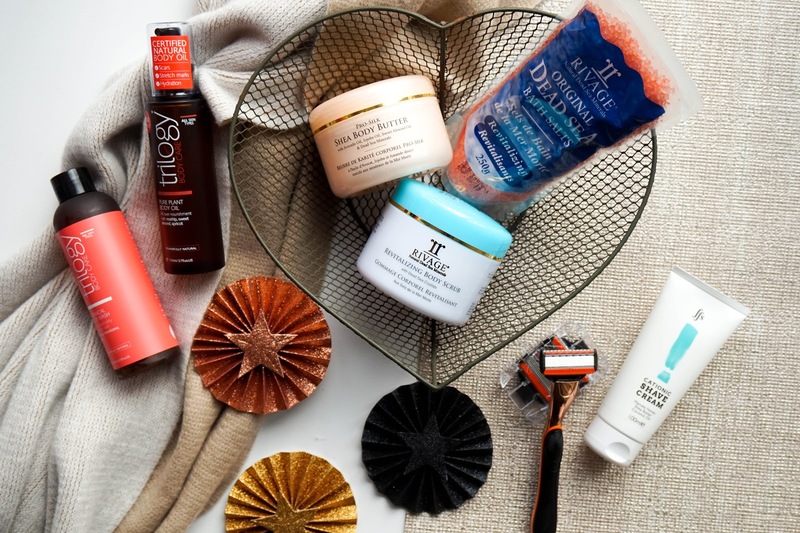 What makes a pamper routine even more special is of course the products used and today I've got some fab newbies to tell you about. Natural brand, Rivage is quite new to my pamper routine but I have really been enjoying using some of their products rich in Dead Sea Minerals sourced directly from Jordan. I was sent a variety of goodies including bath salts, body scrub & body butter, which are all perfect for the winter go-to pamper routine. What I love most about the brand is their focus on using the healing hands of nature to nourish your skin and keep you feeling healthy. The Dead Sea waters and muds have amazing health benefits, with minerals that help to illuminate, awaken, nurture and nourish the skin. It's also great to know that Rivage products are environmentally friendly and have never been tested on animals. The Revitalising Dead Sea Bath Salts* are quite new to my routine, as I tend to use bath bubbles or a bath bomb every now and then as a special treat. 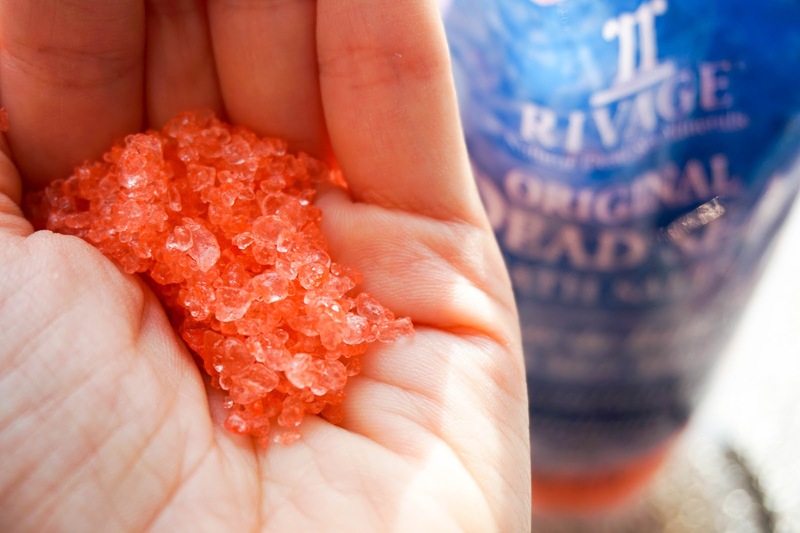 The natural minerals in these bath salts are concentrated ten times higher than any other ocean or sea. Bath salts like these are typically used to soothe, clean and refresh the skin, not to mention that it can also reduce muscular tension. I like to add a handful to the bath early on to make sure they start melting away as I hop in, plus they add such a lovely aroma that really helps to make you feel relaxed. 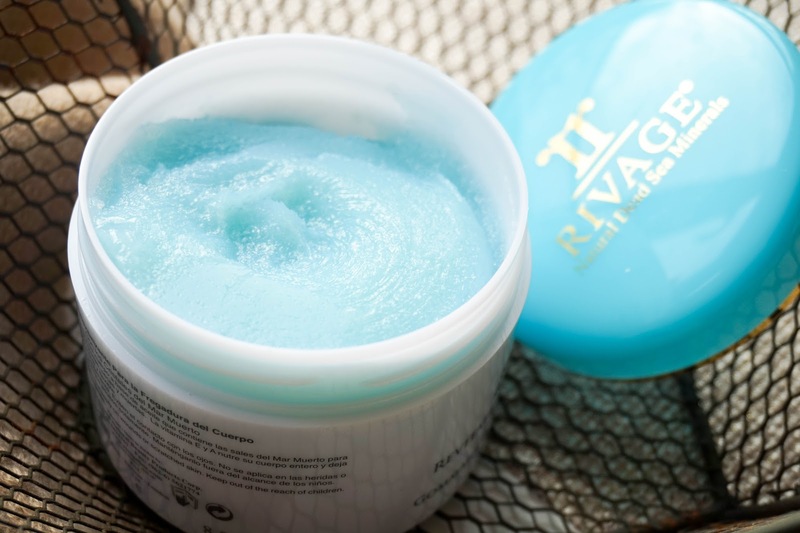 Another product that I have been enjoying from Rivage is the Revitalising Body Scrub*. The tub packaging of this feels quite luxurious with gold accents throughout the design, which looks good in my bathroom cabinet too. The main active ingredients are Castor Oil, Vitamin E and Dead Sea Salt Crystals, which work together to midly scrub the body and protecting the skin. First time I used this when my skin was already wet and I did;t find it as gritty as I usually like my scrubs to be. Second time around I used it on dry skin, which worked much better for me personally. It really helped to exfoliate leaving skin feeling super smooth. But best of all it felt so hydrating and nourishing... if it was summer time I would definitely get away with skipping on any kind of body moisturiser (the lazy part of me would be super happy of that). Lastly from Rivage I have the Shea Body Butter* that is also packaged in a luxurious tub with similar gold design. 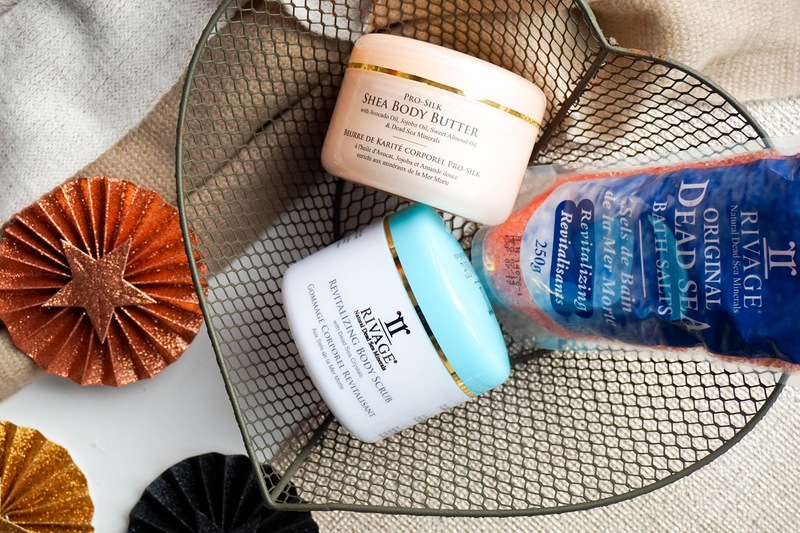 The main ingredients are Almond, Avocado Oil, Dead Sea Salts, Vitamin E and Shea, which is exactly what you would want and expect in a nourishing body butter. This unique blend of ingredients focuses on promoting cell regeneration, whilst moisturising and healing the skin at the same time. It really does leave my skin feeling super soft with a radiant glow. Once again you'll hear me rave about Friction Free Shaving*, which I introduced on the blog not too long ago (check here). This time around they have created a brand new Cationic Shaving Cream to accompany their fantastic blades for your personal 'Shaviour' Kit. 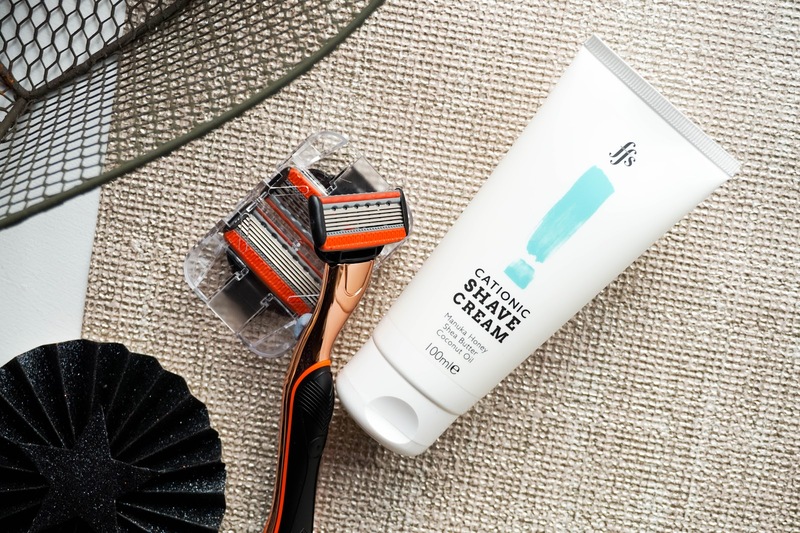 I've never actually used a shaving cream before, but since I've introduced this version along with the brand's beautiful Samantha Razor (hello it's copper!)... I've had such a clean and precise shave, every single time with longer lasting results. Plus there's been none of that annoying skin itchiness, irritation or ingrown hairs. 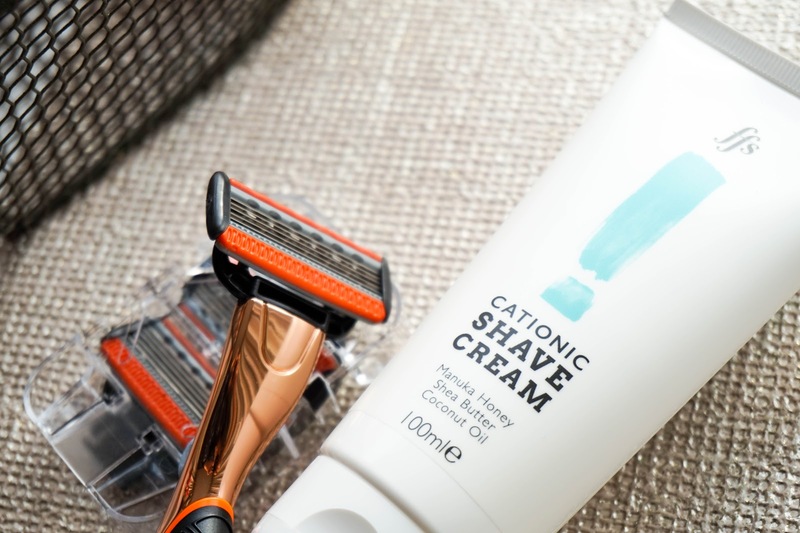 FFS have definitely got it right with the Cationic Shaving Cream, as it's especially designed for women and packed with Manuka honey, Shea butter and coconut oil. Its unique ‘cationic’ formula helps to reduce any kind of friction, so you will get a super close shave and smoother skin as a result. Who knew one simple product could make such a difference?! Lastly I've got a nourishing shower/body duo from a brand that I've had my eye on for some time now. Of course I'm talking about Trilogy with their Body Beautiful Set. I've briefly tried the brand in the past with their CoQ10 Booster Facial Oil, but never had the chance to explore anything else from them until now. I spotted this little set whilst browsing through FeelUnique's Christmas guide as you do... and with 20% off as one of their special offers, I just couldn't say no. 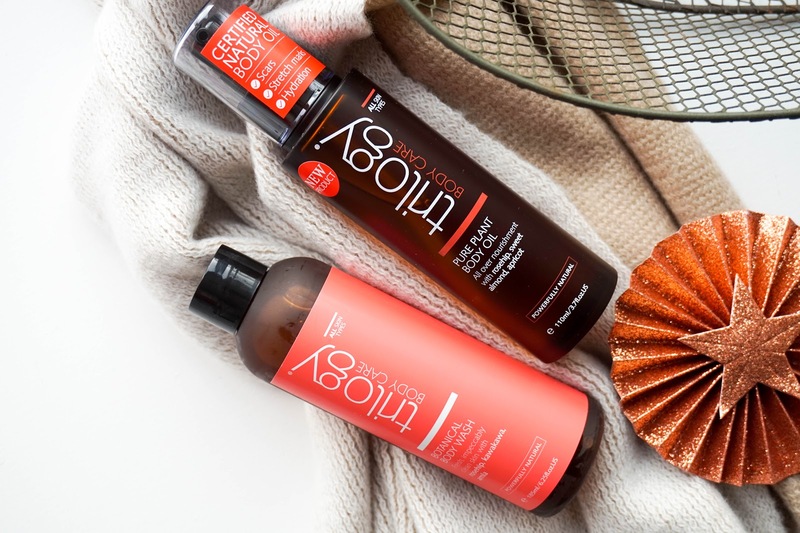 This set contains a deluxe size of the Botanical Body Wash and a full sized Pure Plant Body Oil, which is the newest product from the brand's recently revamped body care range. The Body Wash is gentle and non-drying for all skin types but still delivers fresh, clean skin. What I love most is the relaxing, aromatherapeutic fragrance. The Body Oil contains rosehip oil to repair and hydrate, sweet almond oil to stabilise the natural pH of the skin, along with apricot oil to soothe inflammation. It also helps to improve stretch marks and scarring, plus it is ideal to use during pregnancy. It really is an all rounder and it feels super luxurious on the skin. I like to alternate between using this oil or the above body butter, depending on how my skin is feeling. Overall it's a lovely gift set and it makes me want to try even more from the brand.